The International Tin Association’s fourteenth annual survey of tin users gathered data from tin users worldwide between June and August 2018, showing robust growth of 4% in 2017 but much weaker tin use growth forecasts in 2018. Tin use growth in China has stalled though elsewhere the picture is more positive. 109 companies took part; accounting for some 38% of estimated global refined tin use. 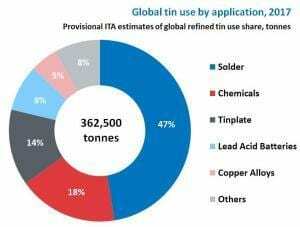 ITA’s latest estimate of refined tin use in 2017 is 362,500 tonnes, based on data from the 2018 survey and trade data. The figure is 7,000 tonnes higher than the preliminary 2017 estimate made following last year’s survey. Refined tin demand reported by survey participants increased by 4% from 2016, in line with our recent global estimates. The survey suggests 3% growth is anticipated in 2018, but we believe that global tin demand will grow by just 1%, with a contraction in tin demand in China offset by growth elsewhere. Pipeline refined tin stocks held by surveyed companies at the end 2017 amounted to the equivalent of 3.27 weeks’ supply. If this ratio is extrapolated based on global consumption it would imply that world consumer stock holdings were around 23,000 tonnes. Comparing with data for 2016 and forecasts for 2018 indicates declining consumer stock holdings over the three year period. Solder still accounts for the largest global share of tin use, growing by 3.7% in 2017. China forecasts for 2018 are more negative, with some impact from the escalating US-China trade war. Miniaturisation remains the greatest threat, especially in China, balanced by market expansion and significant opportunities in new markets including energy technologies. Average lead-free share for electronic solders remained stable at 68% in 2017. There is a continuing trend towards use of lower Pb content specifications in refined tin. All reported tin use in tinplate was now <100ppm Pb tin with 30% <50ppm Pb and 6% <25ppm Pb. In solder, 73% of surveyed tin used globally was <100ppm Pb, higher in China at 95%. Tin use in chemicals grew by 7.5% in 2017, although growth is expected to slow significantly in 2018. China government environmental inspections continued to impact production and growing US-China trade issues are a concern. Tin price, competition and regulation are still significant issues but overall demand growth is positive, especially for polymer additives. Tin use in tinplate continues to remain static or in decline, although some growth was estimated for 2017 outside China where some, mostly smaller companies, were more positive than expected for 2018. Overcapacity and competition continue to impact the industry, recently compounded by US steel tariffs, but there is some optimism that new pressure on plastics may make tinplate more competitive in the future.